An exchange with one of my readers on Medium in The Writing Cooperative – Joe Varadi – prompted me to write this follow-up to my The Devil is in the Details post about details we often miss as we’re copyediting or proofreading our own work. Part of our discussion was about the American rule of always placing periods and commas inside / in front of / before the final quotation marks, even we’re only quoting the last word(s) of the sentence. As many have mentioned over the years, it does look odd, and no, it is not intuitive. And honestly, it makes no sense. Several other readers also mentioned the Oxford comma, so I’m hoping after reading this article that they – and maybe YOU, too – will see why I strongly suggest we form the habit of using it to stay safe as writers. That way we will always know that the ONE time we might really need it – it’ll be in our sentence. Here’s one of the best memes I ran across in the last year on this topic. 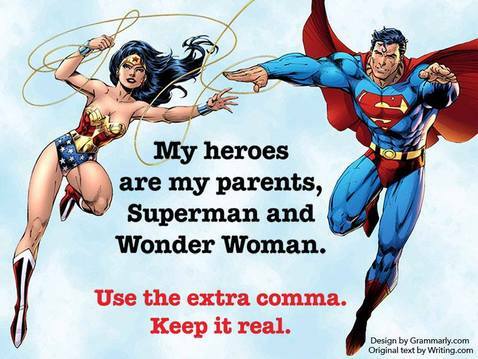 It clearly shows that if we leave out the Oxford comma, many will see the parents as Superman and Wonder Woman. But, surely, the real intent of the sentence is to say that the writer has multiple heroes: the parents, Superman, and Wonder Woman. Now, will the earth crumble and shatter if we leave the comma out? No, but our readers may laugh and wonder what we were thinking if we write anything like that. And one of my goals in writing is to make sure my readers are not confused by what I’ve written. The Oxford comma at least protects me from one type of confusion I could create. Not persuaded yet? How about this one below? As written, is it possible that someone could be confused about the number of positions that are available? Several positions are available: account manager, maintenance supervisor, receptionist and typist. Yes, of course, it’s terrible writing, but it happens everywhere. And one thing Joe Varadi suggested correctly was that many times, we could just rewrite our sentence so that the Oxford comma wouldn’t be needed for clarity, a point I totally support. Sometimes that’s the easiest and best solution. The one above could easily be rewritten: We have four positions available: account manager, maintenance supervisor, receptionist and typist. Even though I would still use the comma after receptionist, it wouldn’t be needed for clarity; writing how many positions are available makes the sentence clear. Thanks, Joe Varadi, for your suggestions! I really appreciate it when readers have points to make I might not have thought of. That’s how we all learn, right? ← Some Punctuation Rules Makes No Sense!